Internet access is a requirement for all in today’s world, however, considering the speed and availability in countries such as, India we need more than just that. Having internet in all devices whether smartphone or computer is a prerequisite, hence internet connection sharing via Wi-Fi hotspot is one of the options that make life easier. 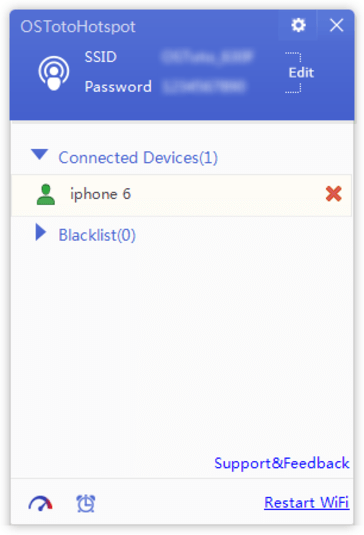 The fact that most of the computers and the smartphones nowadays come with built-in WiFi feature, makes the internet sharing process effortless. While Smartphones running on Android offer a WiFi hotspot option directly in order for you to share your internet connection, a Windows PC on the other hand offers no such option. Therefore, in places where you already have limited option of mobile phone internet and WiFi, the lack of WiFi hotspot option in Windows computers make it even challenging. So what’s next? Hold your horses as today we will introduce you to just the right WiFi hotspot software that can help you build a WiFi hotspot on your Windows computer in no time, and all for free! So drop that idea of emptying your energy into your PC’s network area and let’s get going. 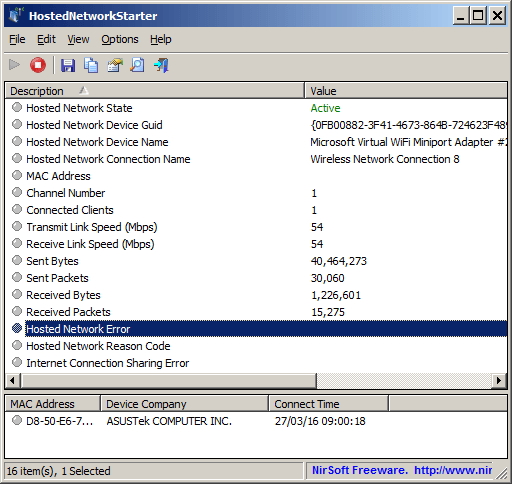 Hosted Network Starter is a free Utility Tool By Nirsoft for creating Wi-fi hotspot in the easiest fashion. This is the most simplest tool available till date. You can use it in windows 7/8/10 with 32 or 64 bit computer. The best thing about the tool is that its a portable tool and you just have ti run this tool. You can also store this tool in your USB to use it anywhere. It offers a clean user interface with only the basic elements added to it that just meets your requirement, rather than creating any unnecessary clutter. It applies the similar approach to its features where you would get only those options that are essential. However, it’s not that elemental as we think as MaryFi offers a more comprehensive feature for its users that is, it works as a WiFi repeater. This tool helps transfer signals from the WiFi router and then transmits it to your computer via the WiFi Hotspot. Moreover, in the absence of an internet connection the MaryFi tool helps you to obtain the shared files on your computer from other gadgets, which also includes LAN games and multiplayers. “My WiFi Router” comes with an extremely user friendly interface for the regular user. The best part about it is the fact that there are minimal items neatly arranged for a much easier understanding for all. While the tool allows you to conveniently administer any of the devices that are connected to your PC, you can also modify device nicknames or bar them and even control momentum. So, go to the “client management” section of the “My WiFi Router” and block certain devices that may be eating up your data speed. The software enables you to transfer videos to your Smartphone and other devices with the help of WiFi. Once transferred you can open the video directly from the browser of your device/smartphone. 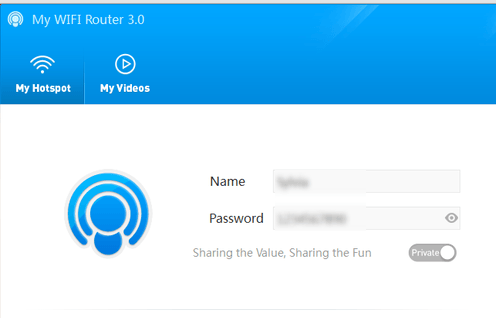 Turn on the option that says “Share Video” and you will receive an IP address. Now you simply need to go to the IP address to access the videos (browse and play), which are saved in one of the PC folders. These amazing features in free service definitely makes the “My WiFi Router” a sought after WIFI hotspot software. It helps you identify the list of web pages via URL Logging that have been accessed while the hotspot was on. Hence, if you find someone accessing any unpleasant websites, you can extract the details using the URL Logging feature for those sessions when the hotspot was on. To expand the WiFi range in your home or in other locations, use MyPublicWiFi software as a WiFi repeater. It just takes a few seconds to widen the WiFi router signal range with the help of this tool. MyPublicWiFi also helps you find out which devices are accessing your WiFi hotspot connection. This will help you identify the users even when there is an open network created by you. Updates: OsToTo Software Co. have officially ceased the support for this software. 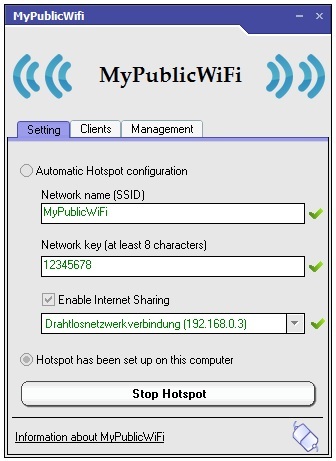 A completely free of cost WiFi hotspot software, 160 WiFi is quite popular among users for its unique features. What’s different about this tool is that despite being available at no extra cost, there are no annoying popups and advertisements that create a disturbance while accessing internet. Considering the extremely uncomplicated installation process, you can turn your PC into a WiFi hotspot in just one click. 160 WiFi allows you to control all the devices that are connected to your hotspot. You can restrict any unwarranted connections from accessing your WiFi hotspot with the help of Password Protection option. This unique free tool is compatible with all versions of Windows including Windows 10.
mHotSpot can track all details about other users connected to your WiFi hotspot along with the internet usage, that helps you keep an eye on the consumption and any activities at the same time. This tool is considerably smaller compared to others WiFi hotspot software covering only 400KB of your computer’s disk space. Considering its smaller size it is extremely easy to download even with limited internet connection. The best part about mHotSpot lays in the fact that it can have upto 10 connected clients. But, in case you do not want to share it with those many clients, you can choose to restrict the number of clients or devices who can access your WiFi hotspot. Allows you to choose the internet source point before even you can build the hotspot. 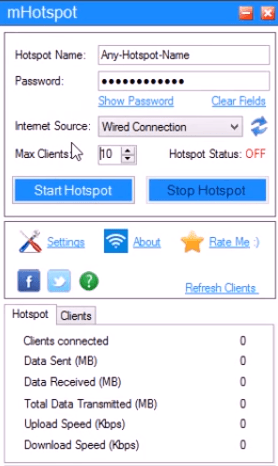 mHotSpot is great hotspot creating tool which helps you to build a WiFi hotspot on your PC with some unique features and in the minimum possible time.